Have you ever taken a bite of a cookie or any dessert, and thought to yourself, OMGosh I need MORE. I mean, who hasn’t right? Recently a friend made these Gooey Butter Cookies for a girl’s weekend, and I was just in love with the texture. They stayed just as soft on day one, as they did by the end of our weekend. And having made these a few times myself since then, I can tell you that they stay soft for at least a week! Have a you ever had a gooey butter cake? I’ve got this Gooey Chocolate Butter Cake recipe that is ridiculously delicious. And it just occurred to me I should totally do that as cookies. I’ve also got this Gooey Lemon Cake Bars recipe, which I made a version of today’s cookies…that recipe will be coming soon! What you’ll love about these cookies, besides that they stay fresh forever, and can be frozen, is the rich butter flavor. They aren’t OVERLY sweet, and the addition of almond extract really brings out the flavor even more! You’ll notice on the internet that these are sometimes referred to as Cake Mix Cookies. And the traditional Gooey Butter Cookie recipe calls for the use of cake mix. However, I decided that they needed to be made from scratch. Because I don’t always have cake mix in my pantry…but the basic staples of butter, sugar, flour, cream cheese are always in my kitchen. First you’ll want to beat the cream cheese and butter, and sugar until fluffy. I use an electric mixer and do this on medium speed for about 3 minutes. Add in eggs and almond extract, beating until combined. Next, add flour, baking powder, and kosher salt. Beat until well blended. Cover the bowl with plastic wrap and chill dough for 30 minutes. In a small bowl, add powdered sugar. 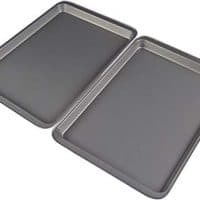 Preheat oven to 350 degrees F. Line a baking sheet with parchment paper. 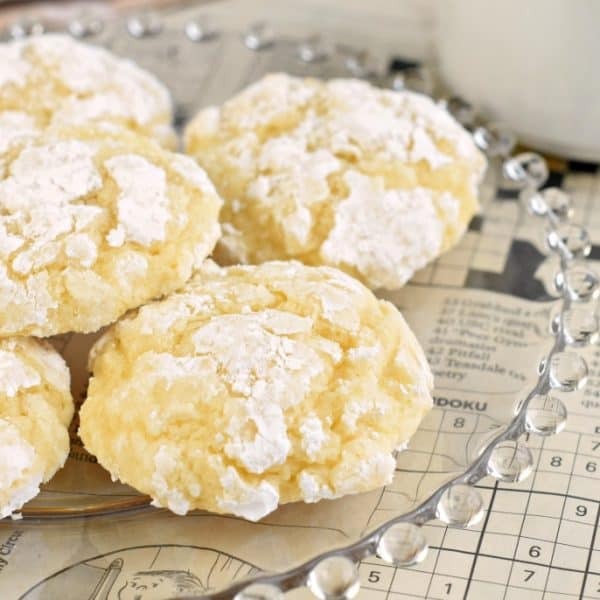 Using a 2 Tbsp cookie scoop, spoon equal balls of cake batter (cookie dough) and roll in powdered sugar, until generously coated in sugar. Place 2 inches apart on baking sheet. Bake in oven for 11-13 minutes. Remove and cool completely on wire rack. So now that you’ve seen my from scratch version of Gooey Butter Cookies, you’re wondering, okay, but what if I do want to use cake mix? Super easy substitution. 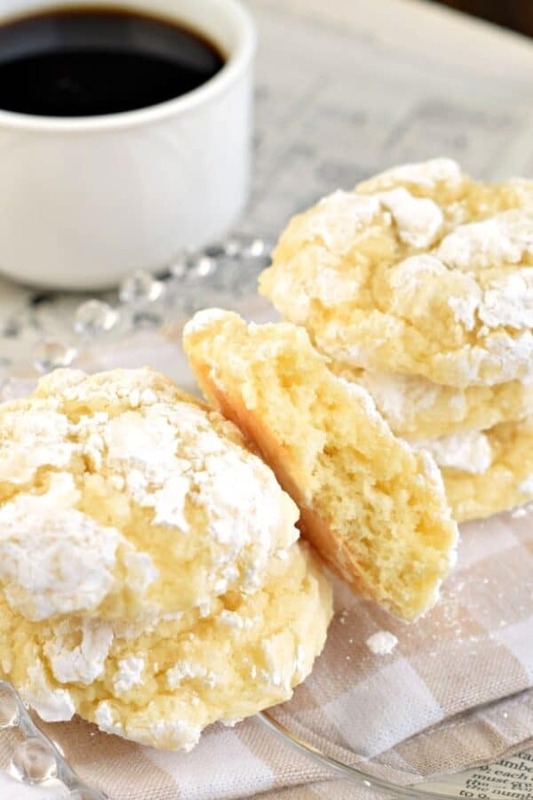 Replace the sugar, flour, baking powder, salt and ONE of the eggs with a box of yellow cake mix. The rest of the directions remain exactly the same! 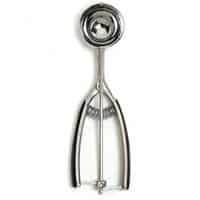 You may also find recipes that call for nonfat dry milk powder. I don’t normally keep that on hand, and I didn’t feel like running to the grocery store for some, so adding the extra egg and flour achieved the same desired result. 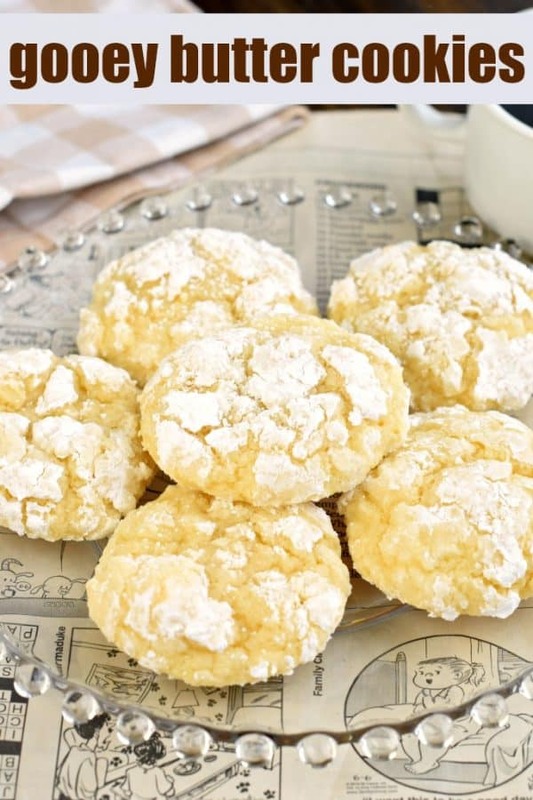 Delicious, fluffy butter cookies! You may have seen these Orange Chocolate Cookies. They were made with a cake mix, and are so fluffy and moist too! 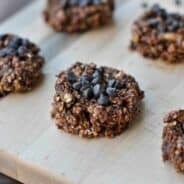 You can always check my cookie archives for some great recipes. But I’ll highlight a few of my absolute favorites to get you started. Pecan Tassies are tart-like cookies featuring the flavors and textures of pecan pie. Delicious, tender, buttery crust, crunchy pecans, and brown-sugar filling, all in one bite. Looking for the BEST sugar cookie cut out recipe? These Cream Cheese Sugar Cookies are so flavorful and they always hold their shape. Don’t forget to add the delicious Vanilla Bean Frosting too! 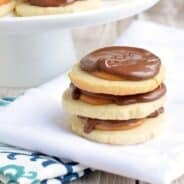 Fill your cookie jar with a batch of these Reese’s Peanut Butter Pudding Cookies from Inside BruCrew Life today! Soft and chewy cookies are always a good idea. These Red Velvet Sugar Cookies from Wine and Glue are all the delicious flavor of red velvet, buttery soft, and crisp on the outside. Topped with some of the best cream cheese frosting! 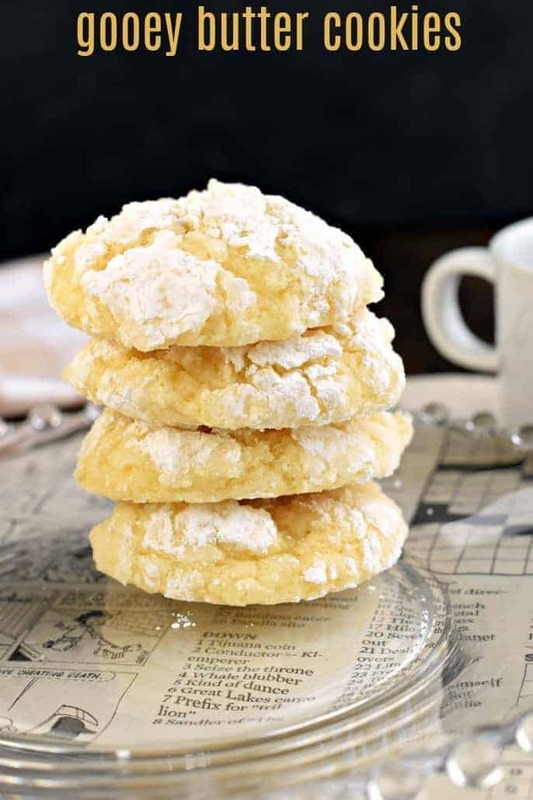 Thick, moist, and flavorful describe these delicious Gooey Butter Cookies. Made from scratch, but I've got a cake mix option if you're in a pinch! In a large mixing bowl, beat butter, cream cheese, and granulated sugar until creamy, about 3 minutes. Add in eggs and almond extract, beat until fluffy. Mix in flour, salt, and baking powder until well combined. 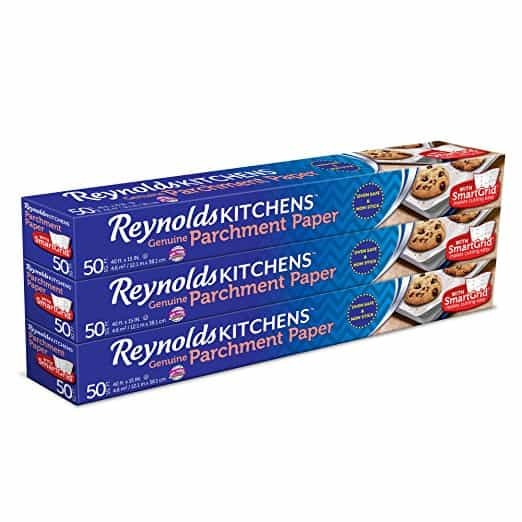 Once chilled, line a baking sheet with parchment paper. Preheat oven to 350 degrees F.
Scoop out cookie dough with a 2 Tbsp scoop. 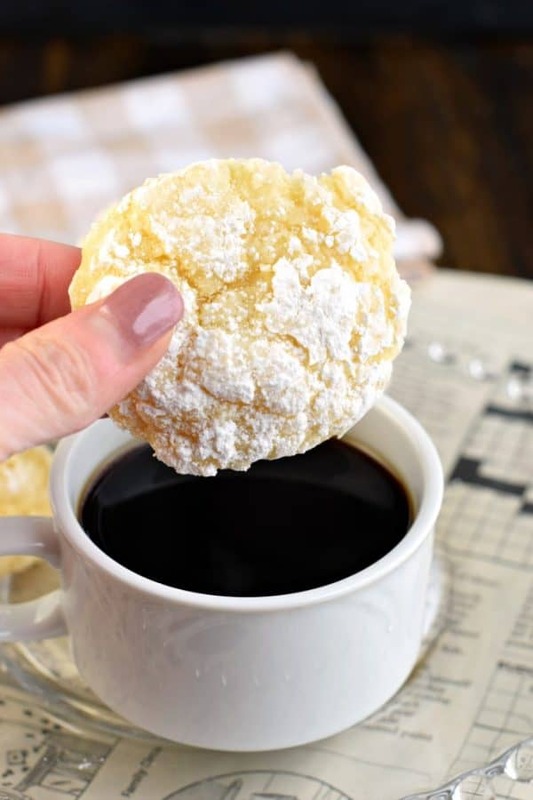 If your hands are sticky, dip them in the powdered sugar first. 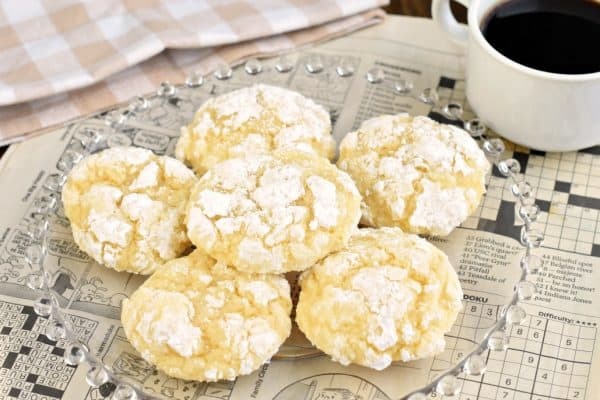 Drop cookie dough into powdered sugar and roll in sugar until generously coated. Place on baking sheet and bake for 11-13 minutes. Remove and cool completely on wire rack. 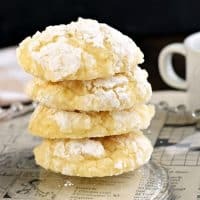 I love soft buttery cookies and have made some cake mix cookies in the past but love your made from scratch ingredients since, like you, I don’t always have cake mixes on hand. Love the addition of the almond extract too. Got to make these the next chance I get. These are a family favorite! So easy to make too. These taste like heaven! So so good. Mmmmm!!!! These are absolutely amazing! Thank you! Love that you gave both options to make! These look so yummy! Can you substitute plain yogurt for cream cheese? I’m going to have to make half the serving because I feel like I’m just going to devour all the cookies haha thank you, great recipe! I made these cookies and they were a huge hit. They were gone in less than two days. I made a cake mix version before I saw your recipe and, I have to say, your recipe is much better than using a cake mix. 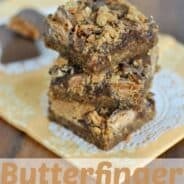 Since we have the option to use vanilla or almond extract, I would like to try using butter flavoring the next time I make these. What do you think? Thank you for such a GREAT recipe.